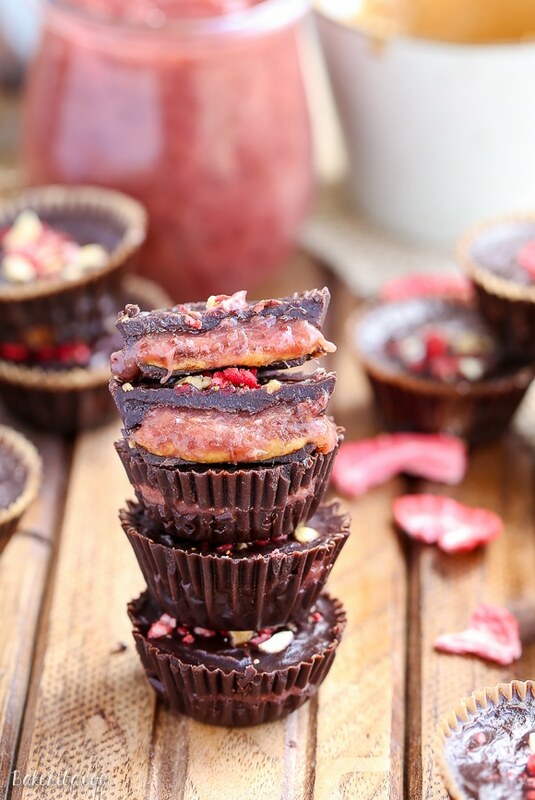 These Chocolate Peanut Butter & Jelly Cups are homemade peanut butter cups with an added layer of jam or jelly! This healthier candy recipe is only 5 ingredients, and uses an easy refined sugar free chocolate recipe. Making copycat candies, but way healthier, has become a recent favorite activity of mine. 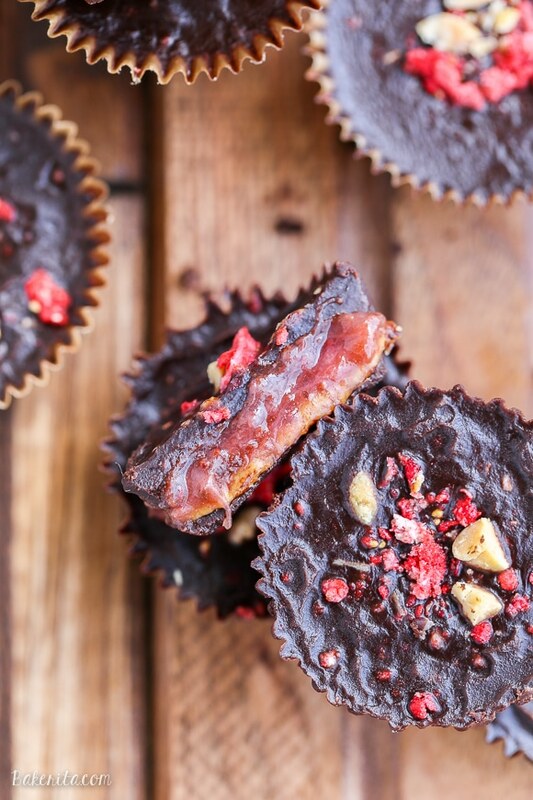 It started with these paleo + vegan Twix Bars, moved onto these Girl Scout cookie copycat Samoa Bars, candy-inspired Almond Joy Brownies, and then these homemade peanut butter cups. The homemade peanut butter cups got me all excited (because I love a good peanut butter cup – or a peanut butter anything, really) and I started coming up with all sorts of peanut butter cup related recipes. 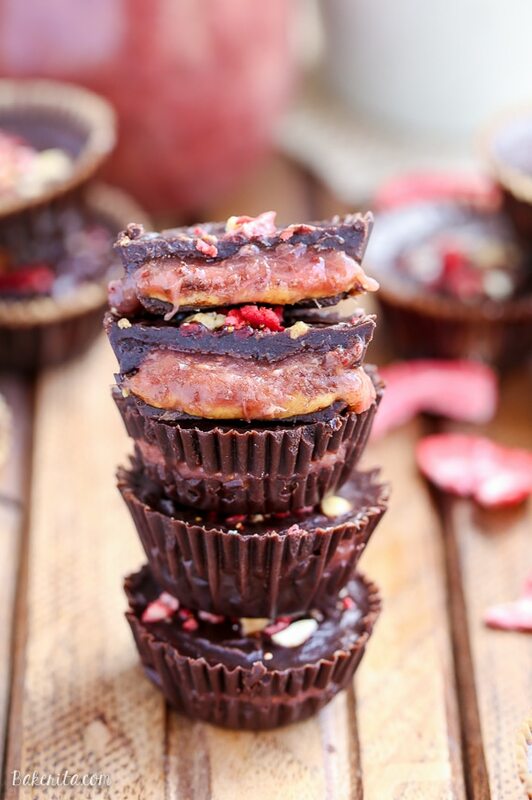 These vegan Chocolate Peanut Butter Caramel Cups came next, and while I was making this strawberry rhubarb chia jam, the idea for these chocolate peanut butter & jelly cups came to me and I couldn’t resist bringing it to fruition. All the peanut butter cups I’ve made, these included, use my favorite recipe for homemade chocolate. It’s refined sugar free and Paleo-friendly, and needs only three ingredients – coconut oil, cocoa powder, and maple syrup. The chocolate sets well in a cool environment, but it does melt at warm temperatures (and in your mouth ), so I’d recommend keeping these stored in the fridge. The filling is simple, but delicious: just peanut butter & jelly! I kept it classic and used a creamy 100% natural peanut butter, but you can opt for crunchy – that’d be delicious. I mentioned that I used my homemade strawberry rhubarb chia jam which is definitely not necessary for you to make, but it is super tasty if you can get your hands on some rhubarb. If you want to keep these peanut butter & jelly cups refined sugar free and don’t want to make your own, try to find a jelly or jam that’s sweetened with maple syrup, honey, or made with 100% fruit. 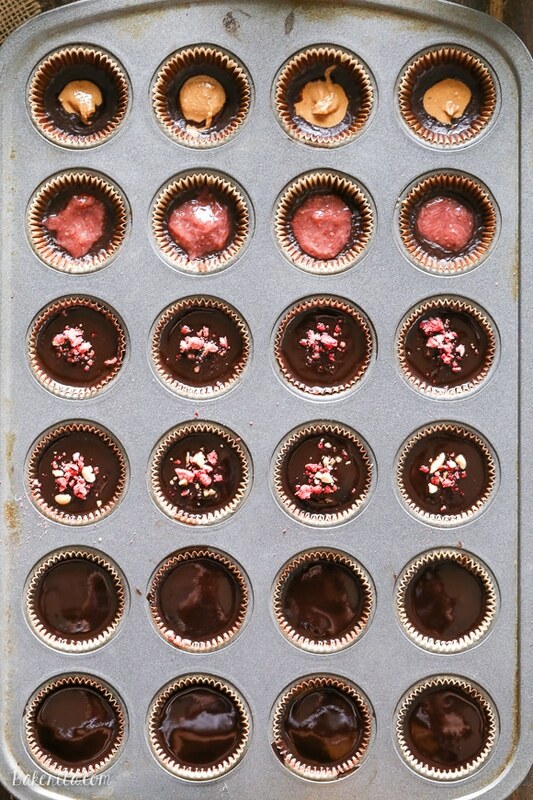 Line a 24-cavity mini muffin tin with small cupcake liners. Alternatively, you can also use a peanut butter cup mold. Pour a small amount of the chocolate mixture into the bottom of each liner or mold cavity, until the bottom is thinly covered. Don't use more than half the chocolate mixture for this. Place the liners in the refrigerator or freezer for about 10 minutes to harden. Once the bottom layer of chocolate is hard, place about 1/2 teaspoon of peanut butter over the chocolate. Add a 1/2 teaspoon of jam over that. Pour enough of the chocolate mixture over the jam to cover it completely (if at any point the remaining chocolate gets too thick to pour, warm it in the microwave for 10-15 seconds to remelt). Repeat until all are covered. If desired, sprinkle the top with crushed peanuts or freeze-dried fruit. Return to the refrigerator to harden completely. Healthy copycat recipes are the best! I’m loving these PB&J cups, Rachel! What a fun idea! I have a feeling I would loose all of my willpower and end up eating these all. Sounds delicious! I love when I can eat a dessert and feel good about it! These little cups look so delicious, Rachel! I love the pb&j twist and that chocolate layer looks heavenly! Oh my WORD Rachel! I wish I wasn’t so hungry right now. I think I need a batch of these stat! Whoa!!! I LOVE this! Everybody I know preferred pb and grape jelly but I have always been a sucker for strawberry! These are calling my name! I can never get enough peanut butter and jelly! What??? Peanut butter and jelly cups?? Oh my gosh, too cool! Wow Rachel! These look amazing! I’m obsessed with peanut butter cups too! And that strawberry rhubarb chia jam sounds fabulous! Thanks for sharing! Girl. . .these look so indulgent. I can hardly believe that they are healthy and refined sugar free. Before I got to Shanghai, I was following a mostly Paleo diet. I haven’t quite gotten my groove here (inability to sleep due to 12 hour time difference, eating whatever I feel is safe enough to not aggravate my tummy etc) but once I do. . .little treats like these are going to be a must. Your candies always look so tempting! This sounds perfect, and they look great. Plus I really like the idea of having chia jam in there. 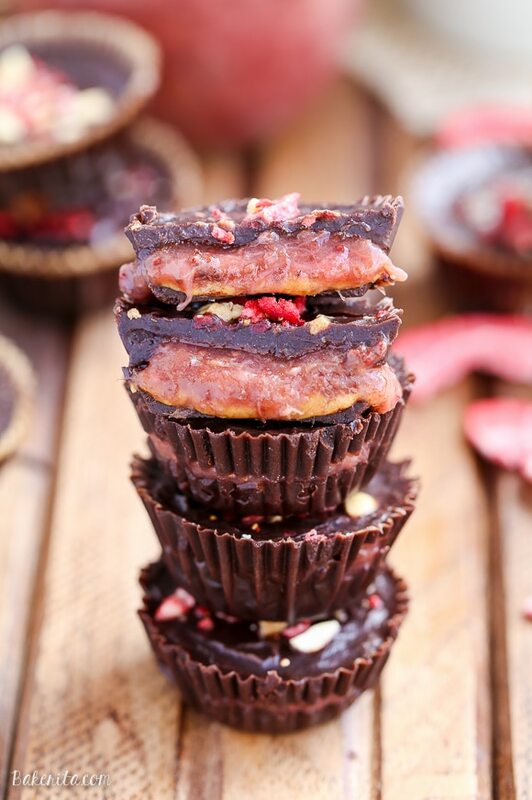 OMG these are little chocolate peanut butter jelly cups are just begging to be made. What a great way to incorporate pb&j – such a nostalgic combo, and then elevating it into an adult candy. Love love love! YES! I can’t get enough of chocolate cups, peanut butter cups, any kinds of cups! Love that these use your rhubarb jam – which also looks heavenly!